Welcome back to the “Top Five” series! This summer series will feature ‘top five’ polymer clay artists tips from around the globe. Today it is my honor and privilege to introduce my friend, Ginger Davis Allman from The Blue Bottle Tree. Today, Ginger is going to be sharing with us her Top Five Polymer Clay Tools. We all have our own favorite tools when we work in the kitchen, at our desk, or even when painting a wall. These are my top five must-have tools for working with polymer clay. Your own favorites will likely be different, but it’s also fun to read about other people’s favorite and learn new ideas. This common, everyday craft tool is incredibly handy for so many things when working with polymer clay. When new, the blades are very sharp and are great for cutting paper stencils and opening stubborn packages of Fimo. I like them when they’re a bit more dull, however. I use them to lift and remove pieces of clay in tight places that my fingers are too large to fit into, to cut out a shape of clay when using a template, and to scrape off rough edges of baked clay. I sometimes even use my craft knife to scrape paint off the surface of baked clay to give it a distressed appearance. Purchase a craft knife on Amazon here. Copyright © by Ginger Davis Allman The Blue Bottle Tree, all rights reserved. This handy tool consists of a pen-sized holder with tiny drill bits. You can use these to drill holes, by hand, through cured polymer clay. It’s perfect for enlarging the holes left from using bead pins. Micro-drills typically come with an assortment of tiny bits that are smaller than what you will find in your typical hardware store. I have used my micro-drill to make holes in thin pieces of wood and plastic as well. See more photos and read the full review here. Purchase a Micro-Drill on Amazon here. A needle tool is, essentially, a needle on a handle. They can be thin and very sharp, they can be thick and a lot more dull. A lot of people use needle tools to create holes in their beads and pendants before baking. Needle tools work well for creating fine detail in polymer clay. You can use a fine one for making faux embroidery (also known as the applique technique). You don’t have to buy needle tools, however. You can make your own set of them. I have a tutorial for making needle tools here. Purchase a needle tool on Amazon here. This little tool is one that I had no idea that I needed until I had it. It is pencil-sized tool with a rubber tip on each end. One end is a rounded point, but my favorite end is an angled wedge. Like a little squeegee, this has save me by picking up spilled paint and liquid clay from a design, fixing fingernail dings in my clay, and smoothing seams. But it really shines when you’re using a cutter to cut out a shape. You know that little bit of clay that’s always left around the edge? Just use your Wipe-Out Tool like a little plow to push and smooth away that excess bit of clay. I wrote a full review of the wipe-out tool here. Purchase a Generic Wipe-Out Tool on Amazon here. You need a very sharp blade for cutting paper-thin cane slices and when doing mokume gane techniques. But most of the time a sturdy and fairly dull, long blade works well for general polymer clay chores. I use mine for cutting slices of clay off a new block, for scraping my work surface, for cutting away and removing excess clay from a sheet, and for making edges of stacks even. Because this most-used blade is durable and fairly dull, I don’t worry about getting cut with it. Purchase rigid clay blades on Amazon here. I like these tools because I find that I use them the most frequently of all my tools, they’re the most versatile, and the give me great results. Another great thing about these particular tools is that they last forever. 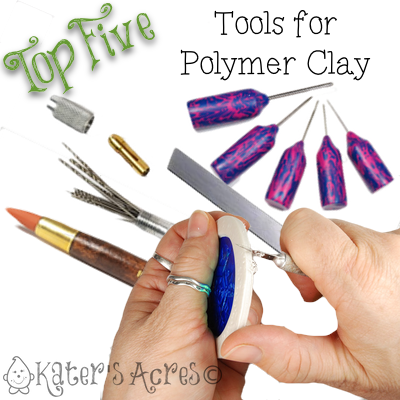 Thanks to Katie for giving me the opportunity to share my Top Five Must-Have Polymer Clay Tools with you. 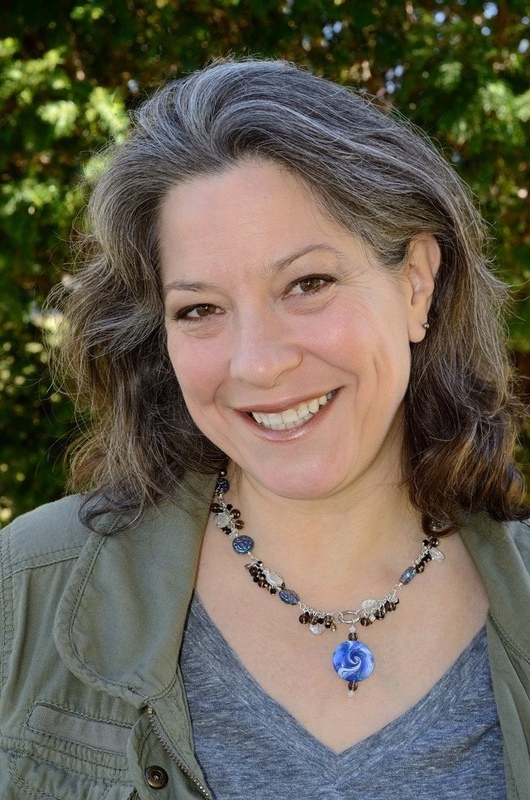 Ginger Davis Allman writes the popular polymer clay website The Blue Bottle Tree. She lives in Missouri with her family, a lot of cat fur, and a lot of scrap clay. Make sure you check out her website for articles about using polymer clay, product reviews, test comparisons, and especially her very popular and well-detailed polymer clay tutorials for clayers from beginner to advanced. You can also find Ginger on Facebook where she shares interesting polymer clay artwork from all over the world. All links above go to Amazon.com where we are an affiliate. OH! Thank you! I will correct them! I bought that wipe out tool also and it’s a great tool. Thank you, Katie, for inviting me to share my Top Five tools with your readers. It’s a great idea for a series and I can’t wait to read the rest of the articles. Thank YOU Ginger! It’s always a pleasure to have you join us.